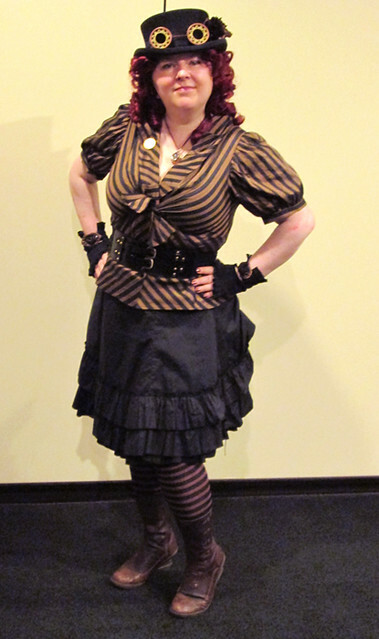 During a talk I did recently I was asked if I had any advice on how best to do a Steampunk mashup costume. For those who don’t know, a mashup is two different genres in the same costume, say steampunk and super hero. If you don’t do enough of both it can often be confusing to the viewer. Ask yourself what would “your character” look like if they were in a Steampunk story. The thing to remember is that costuming is a visual medium. You are storytelling visually and while you may have a great reason for everything you did, it needs to clearly read to the viewer. You are generally not going to get a chance to explain yourself. 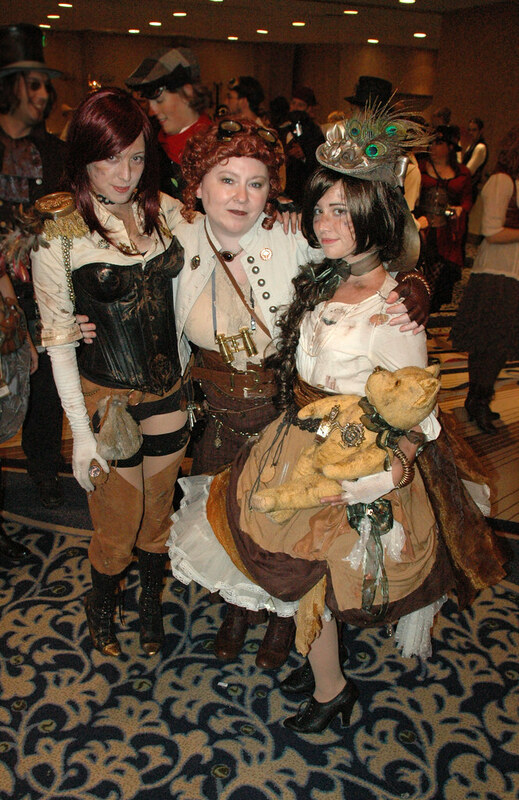 I feel there are three steps to doing a great Steampunk mashup costume. 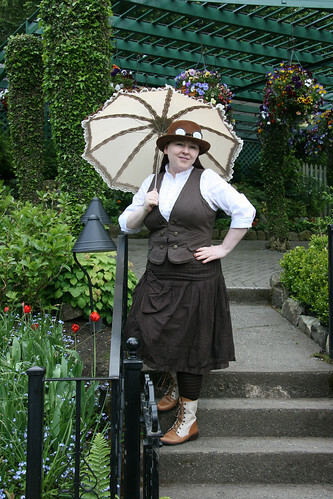 First you should add elements of clothing that clearly look Victorian/Edwardian. Hair styles, hats, corsets, bustle skirts, gloves, parasols, laceup boots, etc. Having this silhouette will create a great base for your costume. Secondly, take a good look at the original character you are planning on creating. What are their primary unique visual cues? Choose at least three to ensure a clear interpretation; the three visual things that most convey that character to an audience. I did a Poison Ivy costume once and for her I feel that you need ivy and or plants in abundance, her clothing should be shades of green and she should always have red hair. For the third step, you need to add elements of Steampunk. This is where you can get creative. Have some fun. Steampunk is essentially a science fiction genre, so add some science fiction or even fantasy. Some people feel that simply adding a corset makes it Steampunk, but it really isn’t quite enough in my opinion. While some feel they are cliché, adding goggles is a good start if it makes sense for you character to wear them. Again, just adding goggles to a costume is not going far enough either. You should try and incorporate two or three elements of steampunk if possible. Gadgets are generally the best visual cue for a Steampunk costume, so try to incorporate a few. Full disclosure, I often feel that I am weak in adding steampunk gadgets, and gizmos. It can truly be the most important and most difficult part. My favorite creation so far was the robotic Zipper on Monty’s shoulder that I created for our Rescue Rangers at ECCC. He is pretty fragile though. I try to add only one hand held prop per costume so you don’t have to constantly put things down and potentially lose or break them. The next great place for a prop is on a belt. I often will have a brass compass or cosmolabe hanging from my belt. Also, belts don’t just have to be at your waist. You can use them across your chest, around your hat or as a collar. 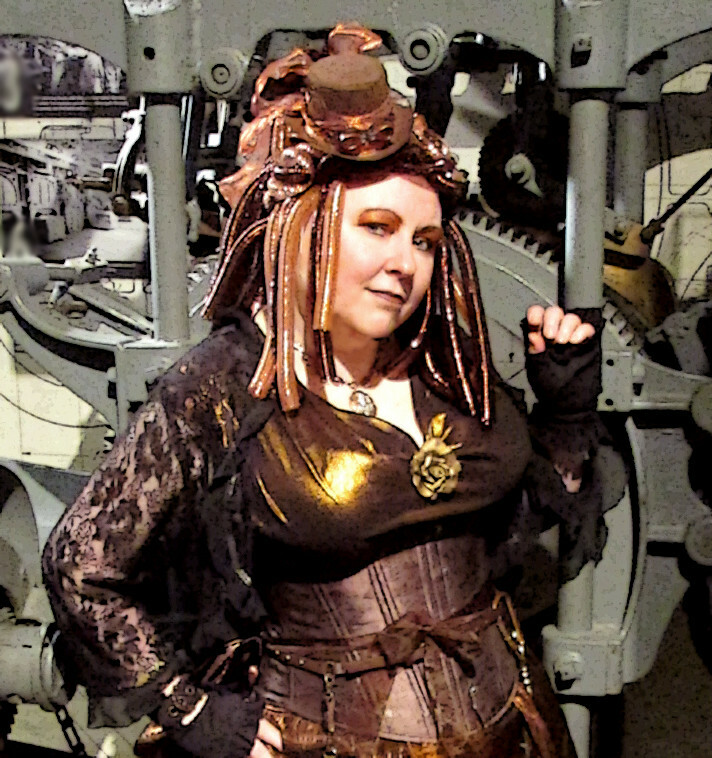 So there is my two cents about what you can do to make a great Steampunk Mashup costume. I hope this helps and I look forward to seeing your endeavors. 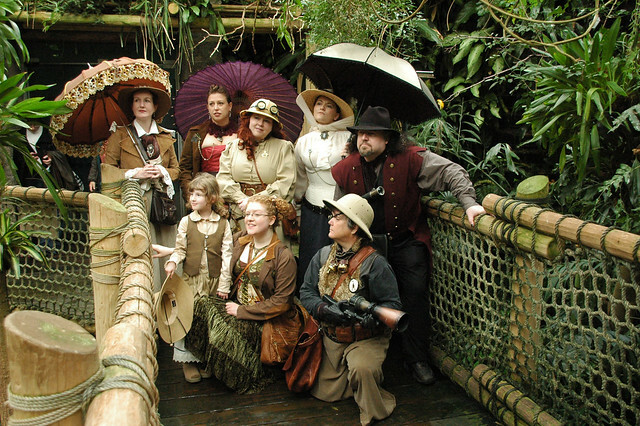 I have created a Flickr group for Steampunk Mashup Costumes. If you need inspiration go and take a look HERE! 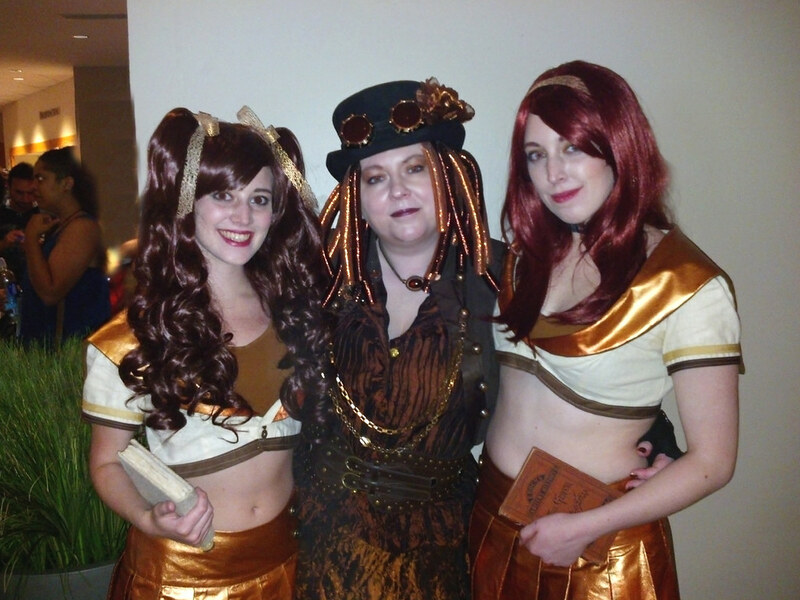 Recently, I had the privilege of attending the first Clockwork Alchemy as their Fan Guest of Honor. It was even more special because it was my birthday on Monday, a very nice way to spend one’s birthday. It was slightly lessened by the fact I had a very mild cold and was on decongestants, but I didn’t let it slow me down much. Clockwork was held in San Jose over the Memorial Day weekend in conjunction with Fanime, a large and long standing anime convention. My husband and I arrived Thursday so that we would be ready for Friday’s festivities. We are very well acquainted with the Doubletree hotel where CA was held because it had housed several fannish conventions in the past including Baycon and Further Confusion. There was a meet and greet going on that night but since it was rather loud, we chose to sit in the bar and chat with folks instead. The bar in this hotel is centrally located and open to the lobby so people can easily find you and join in the conversation. You’ll note a trend in behavior beginning here. Friday morning, we attended opening ceremonies. Paul Guinan and Anina Bennett, the Author and Artist Guests of Honor were introduced and spoke briefly. 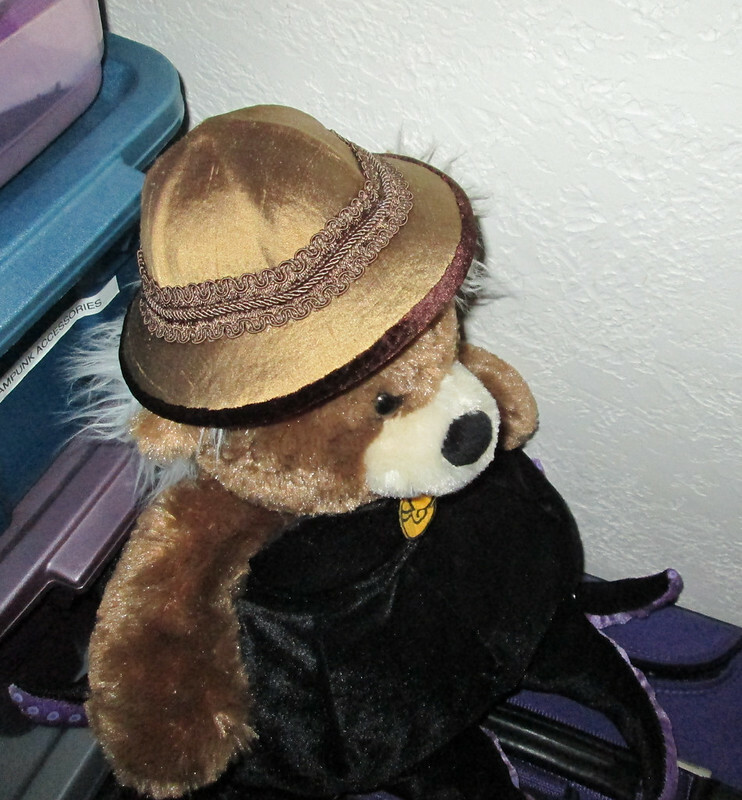 Kory the con co-chair said some very complimentary things about my role in west coast steampunk fandom. I was touched and truly appreciated the recognition. Erica “Unwoman” Mulkey, the Music Guest of Honor performed with her strap-on cello, which got a lot of buzz. Martin and I set up our promo table for Steamcon and chatted with the few folks who came by. Attendance was light, but it was only Friday. I did a talk called “Modding for Wimps” that was not well attended, but still enjoyable. I did it as a Powerpoint presentation since bringing all my props down from Seattle on a plane is too difficult. That night we took the opportunity to head over to Fanime at the convention center to check things out and do a little shopping. The folks at Xcentricities have a fabric with a gear pattern that I had asked about getting it in purple with copper gears. They made it as a waist cincher and my husband graciously bought it for me as an early birthday present. My friend Margaret gave me some gorgeous purple lace and feathers to deck out a hat I had bought from her at another show. I bought a curly purple wig to go with all the purple. We met up with Paul, Anina and two more friends and headed off to dinner. After food, we went to a private club and had cocktails. 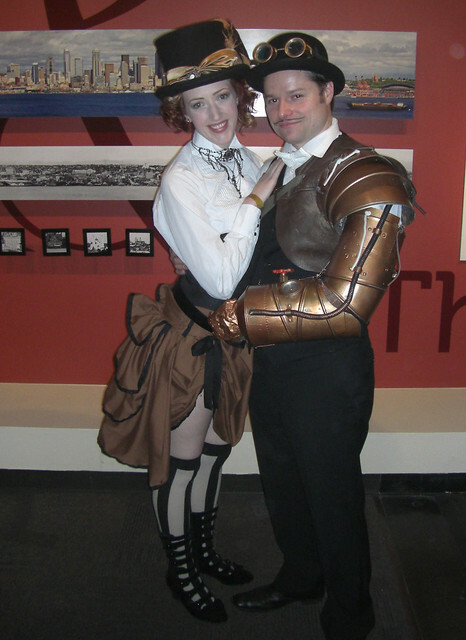 The other patrons were completely enamored of the steampunk look and I think we made some new converts. One gentleman offered to buy my goggles, and since they were a pair that I made, I was very flattered. Saturday after breakfast I was booked on a large block of programming. From 11:00 – 1:00 Jean Martin did a group interview of the Guests of Honor. Kathy and Shannon O’Hare from Neverwas Haul were the Maker Guests of Honor and told stories from Burning Man and other events. Paul and Anina talked about Boilerplate and their new book Frank Reade: Adventures in the Age of Invention . 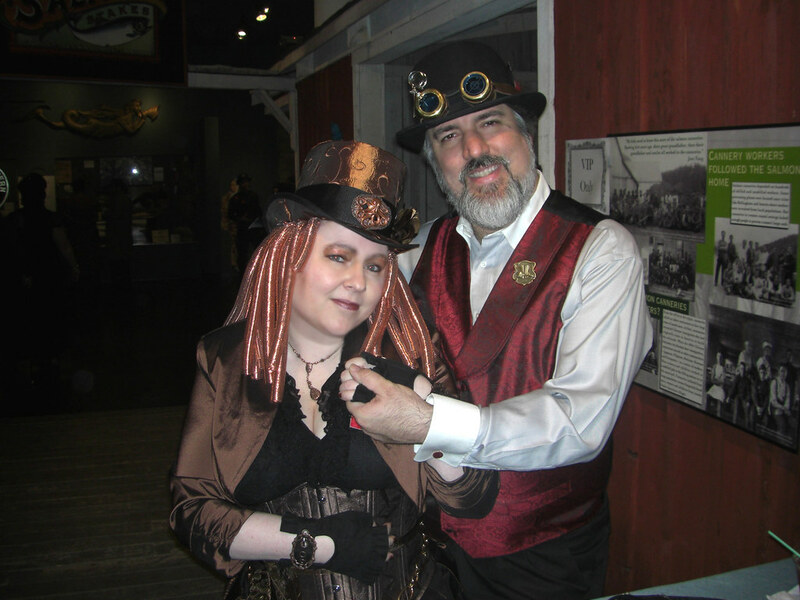 I talked about how Steamcon got started and how that lead to me becoming a speaker, an educator and many other improbable things. 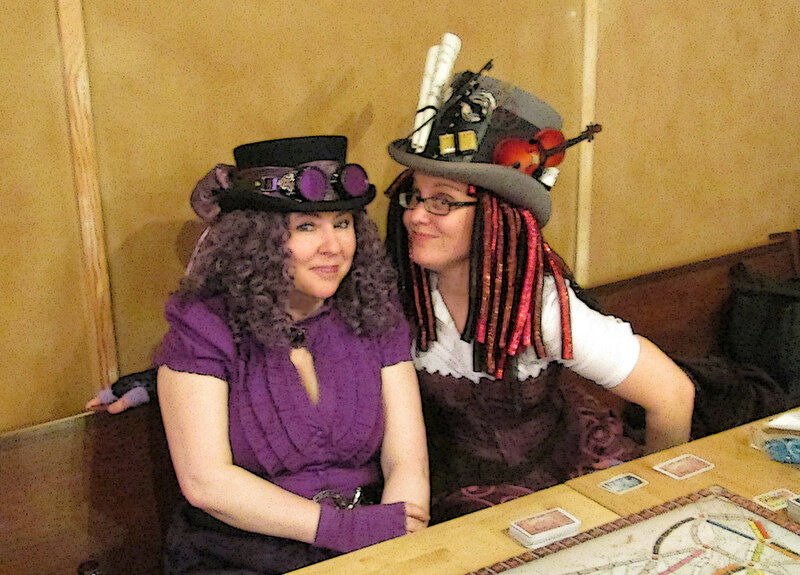 Erica spoke on her music and to my delight gave Steamcon a nod for getting her a start in the steampunk community. I ducked out a little bit early to grab a quick bite (not an easy task) and get ready for my “Steampunk Litmus Test” talk. 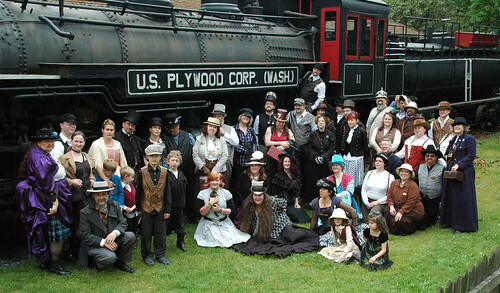 It was a large and enthusiastic crowd and we had fun discussing the various things that really make a story steampunk. The rest of the day, we talked to folks at the promo table and I managed to get some interest in my book, “Steampunk Archetypes.” We had dinner at the sushi bar again and then I changed into the new corset and wig for the concert. My feet were tired and my cold was wearing me down, so we adjourned to the bar with some new folks to chat. You spotting the trend yet? Sunday, we again manned the table and talked up Steamcon. In the afternoon I did my talk on “Seven Steampunk Fallacies.” I had not done that particular talk before and being a Sunday, I wasn’t sure how popular it would be. I guess the title piqued their curiosity because the room was packed and stayed that way. I took questions after I went over the initial points and the audience seemed entertained. Afterwards we were supposed to go to dinner with the con chairs, but Spencer’s was unexpectedly closed. Martin and I eventually resorted to bar food once again for expediency. Shortly afterward, I spoke to a reporter from USA Today about all the fun that is steampunk, so that is something to watch for. I changed into my copper gown for the Ball, but since I don’t dance we ended up in the bar chatting with some fabulous people. It was a good weekend for lively conversation with fascinating people. Monday morning, the con was still going, but many people used the day for travel, so attendance was light. I hadn’t completely lost my voice yet, but it was getting squeaky and it hurt a bit to talk. I was supposed to be on two back to back panels but they were both full of lively panelists, so I suspected that I would not be missed. Besides, it was my birthday and I wanted to celebrate a bit. My husband and a friend took me over to Fanime to do some actual birthday shopping. The majority of the booths were filled with figurines, and anime videos. I love looking at the art books, but they are quite expensive. The costuming is mostly too small for me, but I did find a gorgeous copper colored corset at Timeless Trends and my husband got it for me! Two corsets for my birthday! I am so spoiled! I bought myself a couple of small Re-ment boxes of tiny food and a tea service, indulging in one of my hobbies. I also got some colored reflective lenses for my goggles. We took the opportunity to eat away from the hotel for lunch. By the time we got done, the con was basically over and the dealer’s room was closed. We took a few pictures at the picturesque Sainte Claire hotel before heading back to the Doubletree. We found Paul and Anina in the bar and we spent a pleasant while chatting. A friend whisked us off to a Teppanyaki place for dinner. Prawns! Yum! Then back to the hotel bar to chat. My loving husband had procured a red velvet cupcake for my birthday. No candle, but they are really unnecessary, not to mention a fire hazard, after a certain age. Ahem. It was a wonderful way to spend a birthday weekend. My thanks to the convention organizers for having me as fan guest of honor. I was quite proud to be instrumental in the launch. For a first year convention, there were some hiccups, as there always are, but it ran quite well on the whole. The staff was friendly and responsive. I expect great things from this convention in the years ahead. The main problem was not the con itself but primarily the hotel food. It’s a decent hotel, but it’s major flaw is that it has very little food within walking distance, if you don’t count Denny’s which I don’t. There is a coffee shop, a coffee bar, a nice bar with a sushi bar in it and a pricey steak house all inside the hotel, but as they cater to mainly business clientele the offerings became less each day through the holiday weekend, making it very difficult on those of us without vehicles. The bar menu shrunk by half its selection after the first day and the sushi bar is closed on Sunday. Spencer’s was closed Sunday and Monday. Sprig’s, the coffee shop was only open for breakfast and lunch. There was supposed to be a “grab n go” for quick sandwiches and such, but the hotel decided not to run it all weekend after it didn’t do well enough the first day. The coffee stand was open sporadically and the sundries shop ran out of many things fairly quickly. We muddled through as best we could, but it was frustrating. I think I would have possibly forgiven all of it if it wasn’t for Tuesday morning. I was feeling quite run down from my cold so grabbing a coffee and pastry for breakfast didn’t seem like a good idea. I needed a real breakfast to get through a day of travel. We went to Sprig’s in the hotel since getting to Denny’s seemed a bit daunting. The waitress waved us at a table but didn’t bring menus. When she finally came over to help us, still not bringing menus, she said simply “buffet? implying it was easiest on her, so we shrugged and nodded tiredly. She then quickly waved in that direction and muttered something about the hot buffet was not out. Slow restaurant, she said and did we want eggs? What kind? Anything else? We both said scrambled would be fine and bacon for him and sausage for me. She left and eventually we got two plates of scrambled eggs and hot tea for Martin. Martin went and got a bowl of fruit for us. My drink was missed, but the busboy kindly brought me an iced tea. We never did get any meat. As we finished the eggs she came and asked if we wanted potatoes, but we really didn’t want to wait around and eat in shifts. This was beyond ridiculous. I went and got a bowl of oatmeal. I really wish she had just given us menus to begin with and told us they didn’t have a hot buffet that day. Martin said he had difficulties with that particular waitress earlier in the weekend. I find it odd because most of the staff was fantastic despite the issues. The waitress in the bar was so good that we felt compelled to give her manager a compliment about her. I do understand the economics of the situation, so I am not surprised, but it definitely negatively impacted my weekend. There was a mishap with a transformer in downtown San Jose on Thursday night, that didn’t affect us. The five hour power outage did cause problems for Fanime, but they soldiered on from what we heard. It caused registration to get way behind and by far the most oft heard complaint was about registration and having to go to the convention center. I know the organizers have heard this and are working hard to make it better next year. The photo Gallery for the pictures taken by my husband is here.